This blog’s author was quoted on the news yesterday, both on Channel Seven’s 6PM bulletin and the Parramatta Sun newspaper. It came from a 4 minute video of 3 men vandalising a train between Harris Park and Granville Stations, taken and uploaded to YouTube on Saturday. A number of photos were also taken. Other than posting a link of this video to social media, this blog’s author did not seek out any further media exposure and was instead contacted by the two aforementioned media organisations. Despite this, it can be useful to know what to do when you see something happening and want to document it for the media. Victorian public transport advocate Daniel Bowen, who has done his fair share of passing on information to the media, wrote some useful tips. The key points are reproduced below. Show the problem. Show the scale of the issue; some context. A crowded train doorway on its own isn’t a problem. The entire carriage being packed, and people giving up and waiting on the platform is a problem. Make notes about what it is you’re showing, and post those (even if brief) with the material. Are we looking at a tram that’s packed because the three before it were cancelled (so the problem is service reliability) or it’s packed despite everything running smoothly (so the problem is service frequency and the number of trams)? Why is this significant? Is it part of a wider problem? Don’t mislead. If you’re aiming to get a problem fixed, your photos and video are only part of the evidence — it may be what sparks further investigation, but fundamentally you’ll be wasting your time (and quite possibly set your cause back) if it turns out you implied something which didn’t really happen. Don’t be creepy or irritate people — when I’m trying to film packed PT, I’m not trying to film individuals, I’m filming crowds. Occasionally I’ll get stares, and I’d be happy to explain what I was doing if ever asked, but do I think there’s a way to film in a crowd while not lingering on specific people, and not giving the impression of creepiness. If possible, be prepared. Sometimes things happen spontaneously, and it might be a struggle to whip out your phone camera in time and snap a pic or shoot some video. Other things are regular events. For the summer timetable crowding, I knew it was happening every day, so took along a proper camera and positioned myself at the end of the carriage to be able to get good shots. Be safe and considerate. Don’t do anything silly to get a good shot, and don’t get in the way. Hold that shot. You’re aiming for footage in a news report, not a music video, so don’t wave the camera around too much. Hold it still and steady, and get shots of at least 5 seconds each, preferably a bit longer. Vary the angles. For television footage, they’ll need to chop up your video so it works well for viewers. Be sure to provide a few different angles. For January’s crowded train footage I included a shot through the end-of-carriage door into the next carriage. It was a bit arty, but worked well — they used it — and helped show context as well — it wasn’t just my carriage that was sardine-like. Video is, of course, better for TV, but photos also sometimes get a run on TV, and online and in newspapers. A mix may be good, if you can manage it! Don’t talk over it. If you’re trying to be a reporter, rather than a witness (if you know what I mean) then don’t talk over the vision. The noise from the event itself may be more important than a commentary, which can be added later. That said, spontaneous commentary can work okay. Shoot video in landscape. It seems to be way too easy to forget that whether it’s on the TV news or Youtube, most video is better viewed landscape, not portrait. Turn your phone 90 degrees before you start shooting – it makes much better use of the camera’s resolution. Where to take the footage? All media outlets these days look for contributions, because good photos and video are invaluable. Contact the newsroom at your preferred outlet, explain what you filmed and why you think it’s important. For a story to get a good run, it may be better to initially give it to only one outlet unless it’s utterly explosive (perhaps literally). And be prepared to be interviewed/quoted, though depending what it is, they may be prepared to take it anonymously, or at least not identify who had the camera. In the coming year, we can look forward to the opening of the Inner West Light Rail extension to Dulwich Hill and the completion of the Opal rollout (currently scheduled for the end of 2014). Meanwhile, expect the major parties to begin to announce their transport plans ahead of the next state election in early 2015, with things like a Second Harbour rail crossing, a Western Sydney light rail network, Bus Rapid Transit for the Northern Beaches, and potentially plans to privatise the state owned electricity transmission network as a means to pay for all the much needed infrastructure all likely to feature prominently. The new timetable drove a lot of traffic to this blog over the previous year, particularly when a draft of the timetable was leaked in May. The clear thing in common here is the North West Rail Link (NWRL), which tends to generate a lot of discussion back and forth in the comments section. The post on the Macquarie Park light rail was the most commented on post and not actually about the NWRL, but the comments soon shifted towards discussing the NWRL. This probably understates the level of sharing over Twitter as tweets are only counted once, regardless of how many times that one tweet may be re-tweeted, whereas Facebook shares are each counted uniquely. That said, the most shared posts have tended to be driven by shares on Facebook rather than tweets on Twitter. WestConnex was by far the biggest generator of hits from web searches, with the home page being the destination rather than the post itself (preventing those posts about WestConnex from ranking higher) and reflects the fact that the car remains the primary mode of transport for Sydney residents. This is in contrast to activity in the comments section and social media, both of which are more likely to be transport enthusiasts, neither of which had WestConnex in their respective top 5 for the year. This does perhaps provide a reminder to some advocates of public transport (the writer of this blog included) that there remains some disconnect between them and the regular person on the street when it comes to enthusiasm for public transport and dislike of cars or roads. Unlike #ImOnlyTalkingToGladys, I know the Shadow Transport Minister reads this blog. So happy birthday to Penny Sharpe! This post will be updated throughout the day to track my progress, and hopefully that of Colin and John who are also taking part. I’ll be Tweeting a bit more frequently on @bambul using the hashtag #AllDayChallenge as the day progresses. Also check the Facebook page and the earlier post. Here is my plan of attack. If everything goes as planned, I start at 5:37AM and finish at 10:24PM. There is a contingency plan if I miss the 7:41AM service to Waterfall from Sutherland, with 2 opportunities to catch up if the trains stop operating to the exact timetable and the difference goes my way by a few minutes (Plans 5A and 5B). It’s not essential I catch the 2:37PM Lidcombe service, so as long as I make the Sutherland connection all my other connections will have quite large buffers through to 4:48PM. I catch the 3:04PM service at Lidcombe, which leaves at the same time I’m scheduled to arrive (Plan 3C). If any of these 3 occur, then it sets up the possibility of getting the 3:41PM serivce from Clyde, which leaves 1 minute before I’m scheduled to arrive (Plan 4A). This would allow a finish time of 9:22PM, or 15 hours and 45 minutes for 176 stations. Otherwise, the finish time should be 10:24PM, or 16 hours and 47 minutes. But those 5 times in bold are the ones to keep an eye out for. If anything’s going to change, then I reckon it’ll happen at one of those times. 4:53AM – On the bus to Central. Should get there around 10 past 5, ready for the 5:30 start. 26 people on this bus, quite impressed by the strong patronage at this ungodly hour. 5:12AM – Under the clock at Central. Waiting for John and Colin. 5:20AM – Colin arrives. John follows a minute or so later before ducking off to buy his ticket. 5:30AM – We are all starting on platforms 24/25. I’m going to Bondi Junction. John and Colin are heading to Helensburgh. Ten random stations are drawn for bonus points. 5:50AM – I arrive at Bondi Junction on T25. It’s the same train back to Hurstville, leaving Bondi Junction at 5:56AM. 6:12AM – 2 police get on at Redfern. I decide not to take a photo, just in case. Will pass through here later anyway. 6:18AM – Terrible photo at Sydenham, can’t see a station name sign. Am moving down one carriage. Slightly further away from the police too. The worst I could get is a bit of a talking to, but even that could mean missing photos of some stations. 6:21AM – The police get off at Wolli Creek. 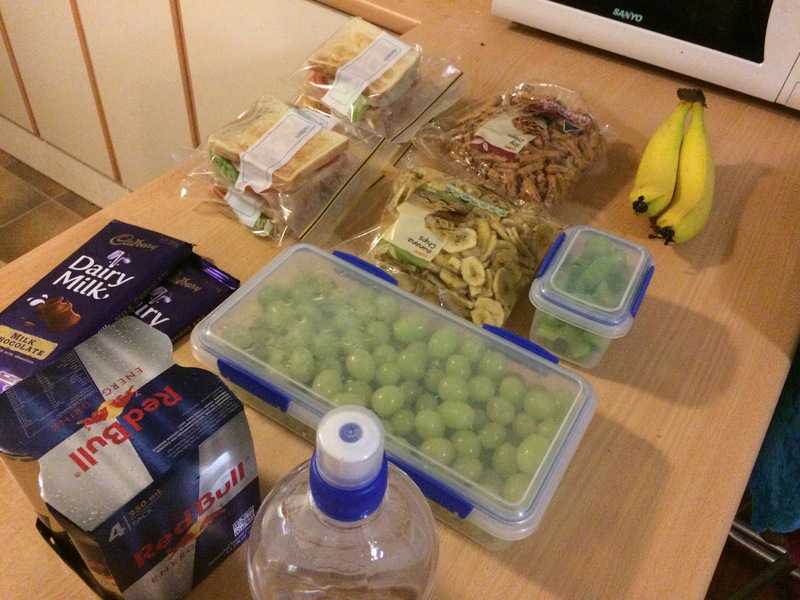 6:35AM – John and Colin just reached Helensburgh. 6:38AM – Made a mad dash from platform 2 to platform 4 at Hurstville. Was on the wrong end of the train to get to the stairs, but there’s only one path South of Hurstville and my new train has to wait for my previous train to pass through before the path is clear. So this was always going to be a 2 minute transfer, despite both trains arriving almost simultaneously. Am now on my way to Cronulla where I’ll meet up with John and Colin. 6:52AM – Hit my head on the luggage rack. Ouch. 6:55AM – I got my first “what are you doing?” from another passenger. 7:13AM – Seems I didn’t notice the 7:13AM train to Sutherland, so am catching it instead of the 7:20AM. That means I’m not meeting up with John and Colin as expected. I am off plan now, but running ahead of time, so it’s a problem I’m happy to have. 7:30AM – Didn’t manage to snag the 7:29AM service, but it wouldn’t have sped up my journey because I’d just be waiting longer at Waterfall (nor could I go on to Helensburgh as there was no train that would get me back in time to keep to my schedule). So instead I have a much more relaxing 11 minute wait for the next train to Waterfall. 7:56AM – Made it to Waterfall. 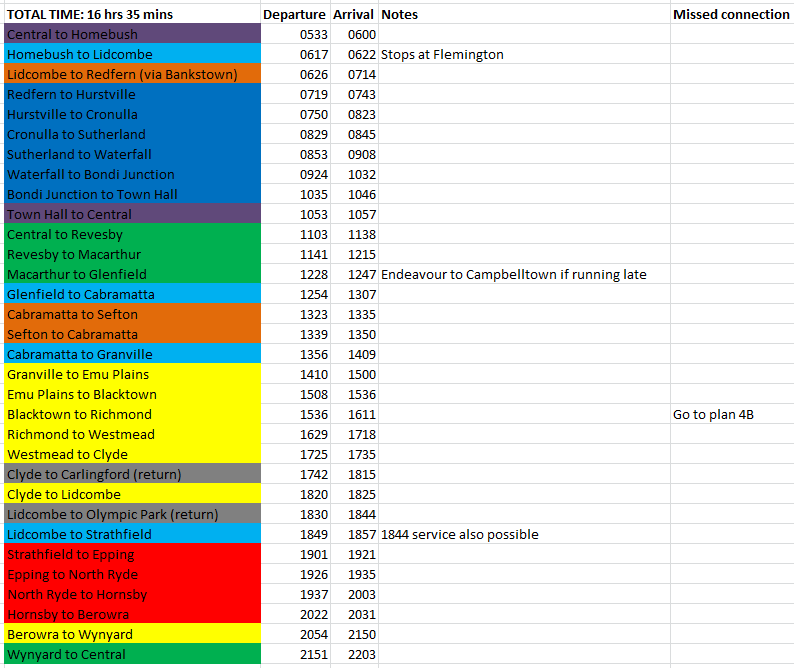 Still need to stop at Como at Oatley on the way back, and then I’ll have finished the Eastern Suburbs/Illawarra Line. 8:27AM – Stopped at Como and Oatley to finish the line. Now for a relaxing 25 minute ride into Redfern. 8:37AM – A medical emergency at Lidcombe has caused delays for inbound Inner West Line trains and outbound North Shore Line trains. Luckily, my next train is an outbound Inner West Line train, and these are still running to schedule. 8:48AM – Approaching Redfern. The plan is to take an Inner West Line train to Carramar and then a Bankstown Line train back to the City Cicle. That’s 37 stations in about 2 hours. I’m currently on 33/176 stations, so that would put me on 70/176 or about 40% done. 9:09AM – Train is 1 minute late. Just saw 3 Waratahs go past, but I get an S-Set. Boooo. Good thing the temperature is still reasonable. If it was midday and approaching 30 then I’d prefer something with air con. 10:00AM – I have some slack in the schedule, so I stay on my train throughout Cabramatta to get it out of the way early (and maybe score some additional points). Get checked for my ticket by police while I’m there. My second run in with police so far today, but no issues either time (except for the missed photo at Redfern, which I had to get later). 10:08AM – Millenium Train! The platform is too short to take a photo of the target plate. 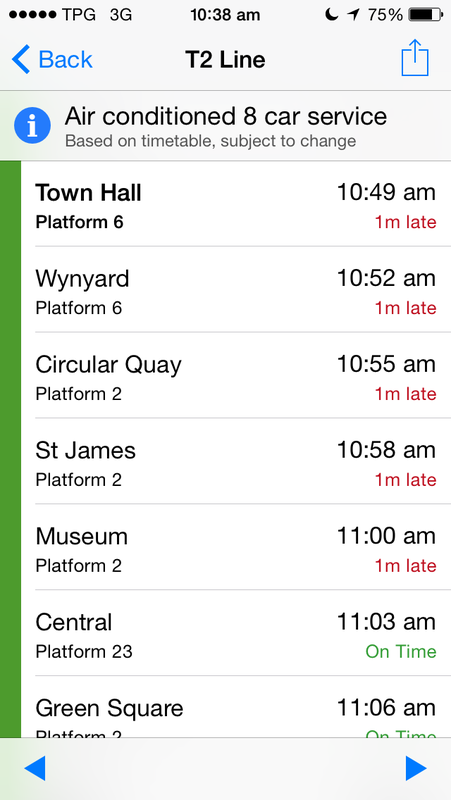 I’ll have to grab that when I get to Wynyard (I have a 14 minute wait for a train there). I’ve now taken S, T, and M set trains today. There are loads of Waratahs around and there’s a chance I’ll get an Endeavour. So right now it’s OSCARs and V-Sets which I’m missing. Am planning on a short incursion into the Blue Mountains, so that’s my best bet. More train types equals more points! 10:40AM – Just noticed another opportunity to gain some time. If I can catch the 1:13AM North Shore Line service from Wynyard, which is timetables to leave 1 minute before I arrive, then I reach Epping 15 minutes earlier. That puts me in the running for the negative one minute transfer at 3:41PM at Clyde. But if I miss that, then it’s back to schedule. 11:16AM – My train was 2 minutes late, so no chance of getting the other train, which would have had to have been 3 minutes late. Real time data wasn’t working, and I didn’t want to risk not getting a photo of the Millenium Train’s target plate. That gives me a 12 minute wait till my next train. 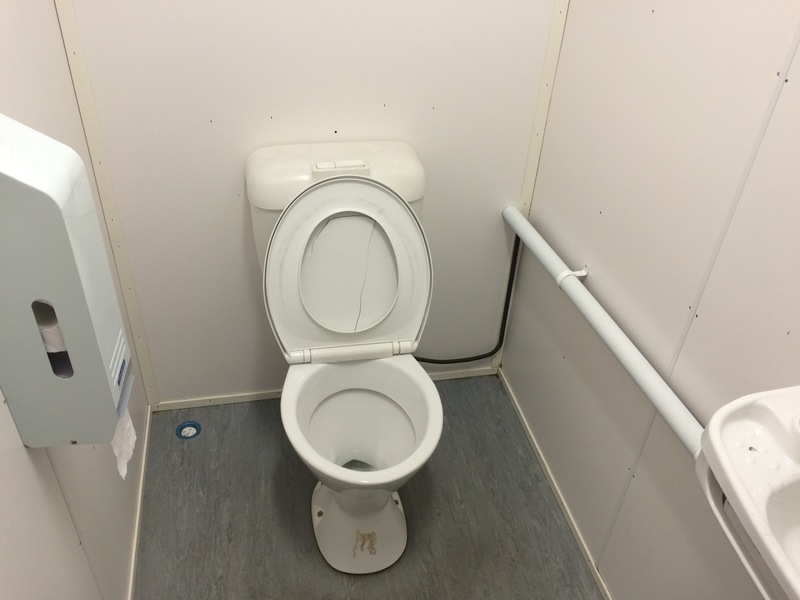 Not enough for a decent toilet break. But it should be enough to do a big enough update on how things are going. Withwynyard (and Cabramatta) I’m up to 71/176. 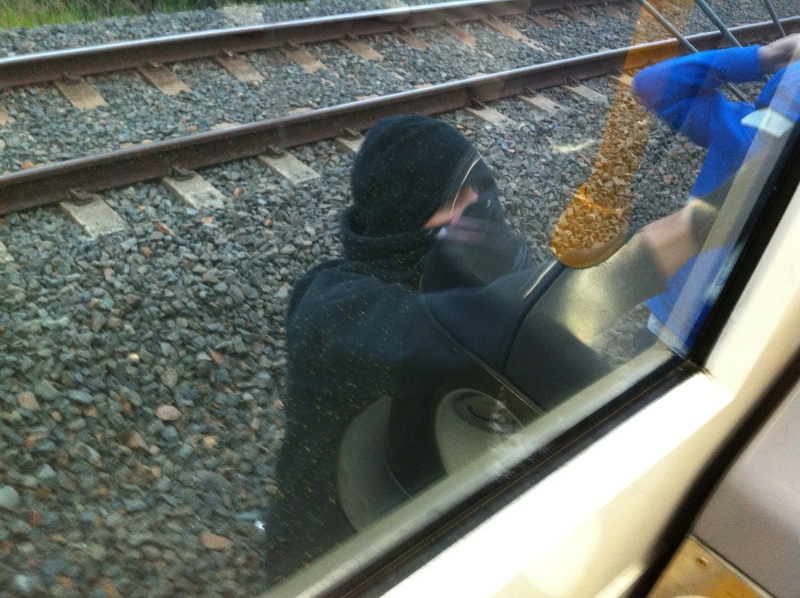 He next key point is at 12:50PM at Hornsby. I need to arrive at least 2 minutes before my scheduled 12:52PM arrival time, and/or for the 12:50PM train to Epping to be at least 2 minutes late. 12:30PM – Finally reach Berowra. Train is running a few minutes late, so my 13 minute layover is more like 9. 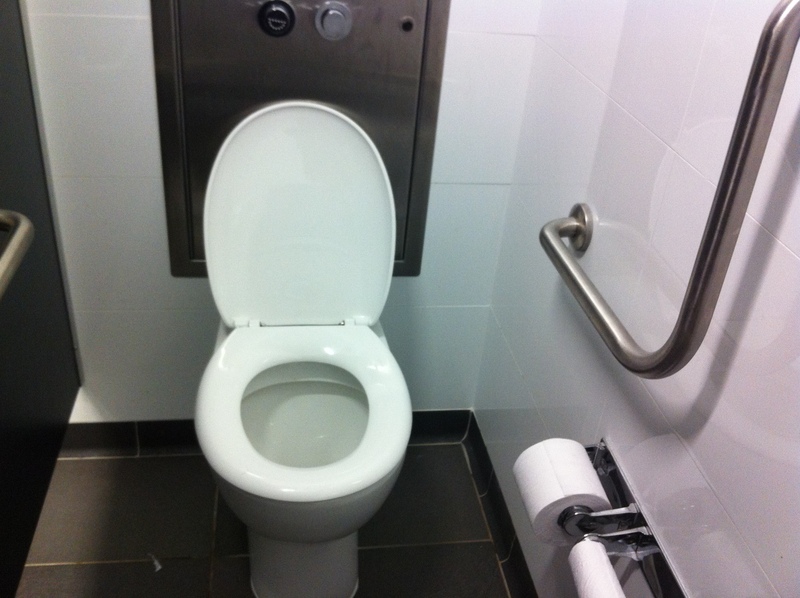 Not really enough time for a safe toilet break, so that will have to wait. Spent the last 3 hours on 3 trains, over an hour on each. But this next leg involves lots of transfers in quick succession. Am arriving at Hornsby at 12:52PM, but if I can get the 12:50PM train from there then it enables another opportunity later in the afternoon. I’m taking a guess at which carriage will be in front of the stairs for a mad dash from platform 1 to platform 3. 12:52PM – There was no train on platform 3 when I arrived, but there was enough time for a toilet break and the toilets were unlocked. Hurray! The difficulty in making this transfer (or the one at Epping later on at 1:56PM) is that the train I’m transferring to is about to start its run and so is very unlikely to be running late. My best bet is the fourth and final opportunity, the zero minute dash at Lidcombe. 1:34PM – With North Ryde done (102/176) that’s half the Northern Line completed. Now I have to back track and finish the lower Northern Line. If luck is on my side, I might get the earlier train at Epping (I need to be at least 3 minutes ahead of schedule), but for reasons outlined above I highly doubt it. 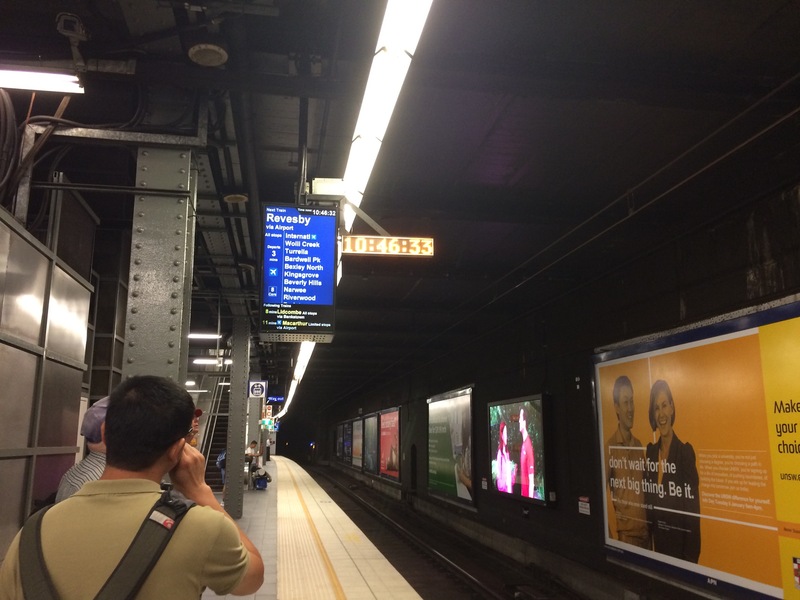 1:37PM – 6 minute layover at Chatswood and then a train back to Epping. Hopefully this train isn’t late! 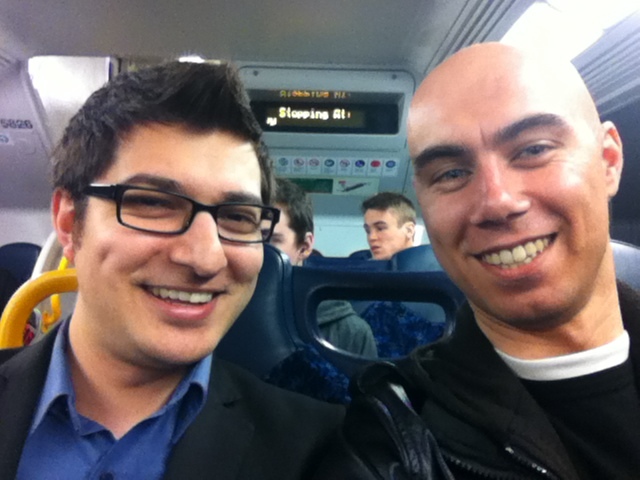 1:39PM – Bumped into a friend at Chatswood who was on his way to Macquarie Park, so we traveled along together. In other good news, the train was an OSCAR. That ticks off one of the two intercity train sets I need. Hopefully I’ll get a V-Set when I head out West later today. 2:11PM – There was no way I was going to make the earlier train. But I’m now on my first Waratah. Heading towards Strathfield, where the transfer is 4 minutes. Doable, so long as I’m not running late. 2:38PM – I got to Strathfield 2 minutes early. So that was a really easy connection. 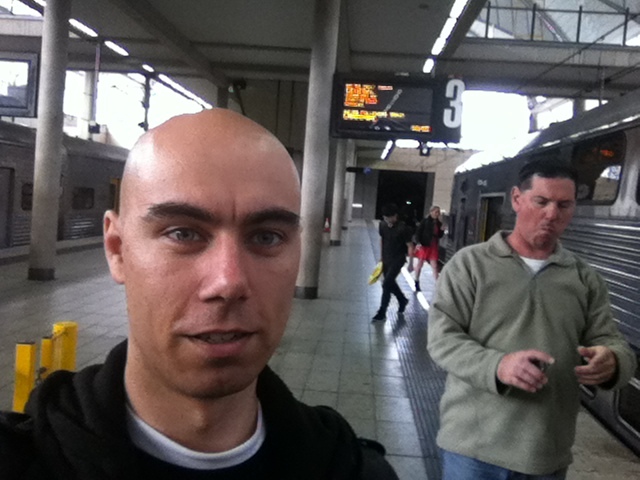 On to Lidcombe to meet up with John and also Craig, who is joining John for a portion of today. 2:55PM – The three of us have a chat and discuss the day so far before a few photos at Olympic Park. I realise that the train back at Lidcombe that arrives at the same time as the Olympic Park train does is running about 2 minutes late, so I make a dash for it. John and Craig have to head East to cover a few more stations before going to Carlingford, so we part early. 3:06PM – I make the early train to Clyde. Having a late running train is good for me making the connection, but if it’s too late then I’ll miss the connection at Clyde for Carlingford. But it’s only 2 minutes late, so I should just make it. 3:13PM – I make the Carlingford train at Clyde quite comfortably. Even better for me is the news that the next train to Clyde is also running late. Ordinarily it arrives 1 minute before I would, but it’s running 5 minutes late. If I make that train then I can finish by 9:22, which is incredibly early! I’m very excited by the prospect. 3:48PM – The 3:42 train was 5 minutes late, so I managed to get it. I am now scheduled to finish 62 minutes early! 4:00PM – Colin discovers that I’m on this train and finds me. We spend the rest of the train trip talking about his previous attempts, this is this fifth, as well as his fourth hour attempt at the suburban and intercity network. 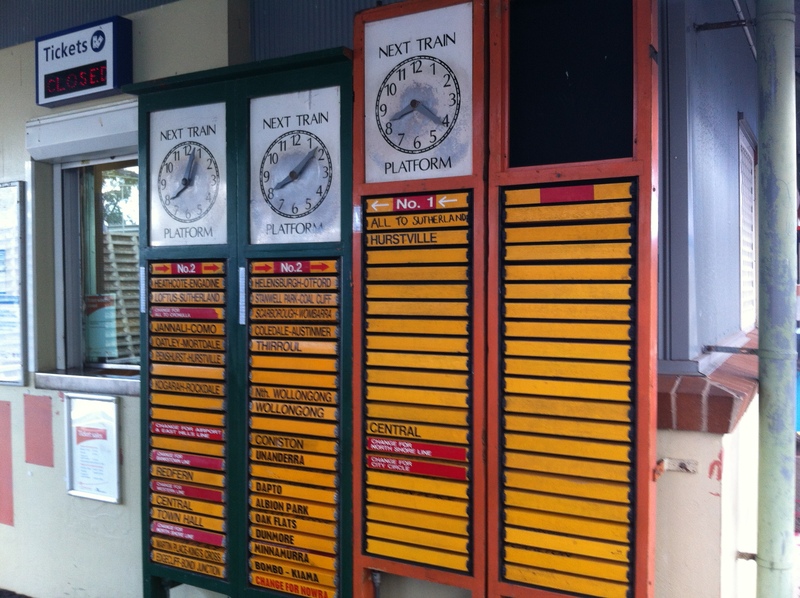 4:32PM – The train terminates early at Penrith. I can still finish at the original time, but can also add some extra Blue Mountains stations without making that finish time any later. The plan is to go out to Blaxland, but Warrimoo is also an option. A quick check on Google maps shows that Warrimoo is an island platform, so a cross platform transfer could be an option. I’ll watch the train times carefully. Colin has decided to cut his losses and try again tomorrow. 4:50PM – On a Blue Mountains train. Heading to Blaxland at least. 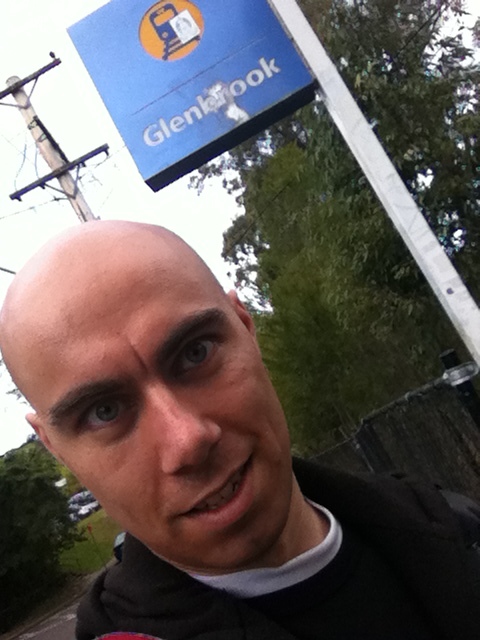 5:03PM – I get off one stop early at Glenbrook (133/176 plus 2 extra). It was an accident, but timing was looking pretty tight anyway, so it’s was probably a good move. 5:15PM – On the train heading back to Sydney. It didn’t stop at Lapstone, and I think it might even run express to Parramatta. I get the feeling e trains on this line might no longer be running to timetable. I really don’t want to give up now. 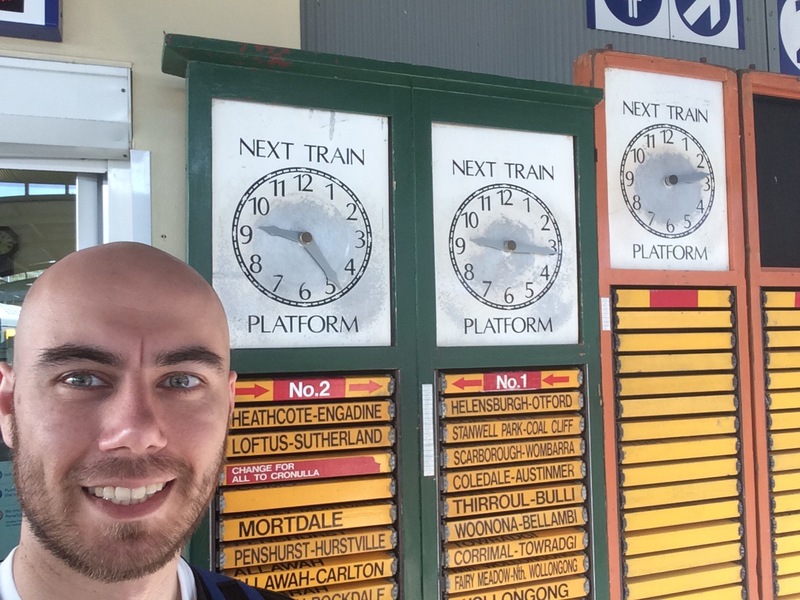 5:22PM – The train stopped at Penrith! I do some quick checks on TripView and it looks like the next train from here to Blacktown gets there in time for a connecting train to Richmond. Might even be possible to finish earlier than 10:24PM if my connecting train at Glenfield is 3 minutes late. 5:32PM – There’s a train to Blacktown in 2 minutes. It gets there 6 minutes before the next train to Richmond. Looks like I would have missed that Richmond train if I’d stayed on till Parramatta. It was a quick decision to get off at Penrith, and luck seems to be back on my side. 5:47PM – I’ve got a 6 minute layover and there’s a McDonalds here. I decide to wait till Richmond, which has a longer layover and also has a McDonalds. As Blacktown has 2 sets of platforms, I need to exit the gated section, which means my first use of my ticket since the police checked me for a ticket at Cabramatta earlier this morning. In my original plan I didn’t change at Blacktown, either to or from a Richmond train, so I wouldn’t have needed my ticket again until the end of the day. 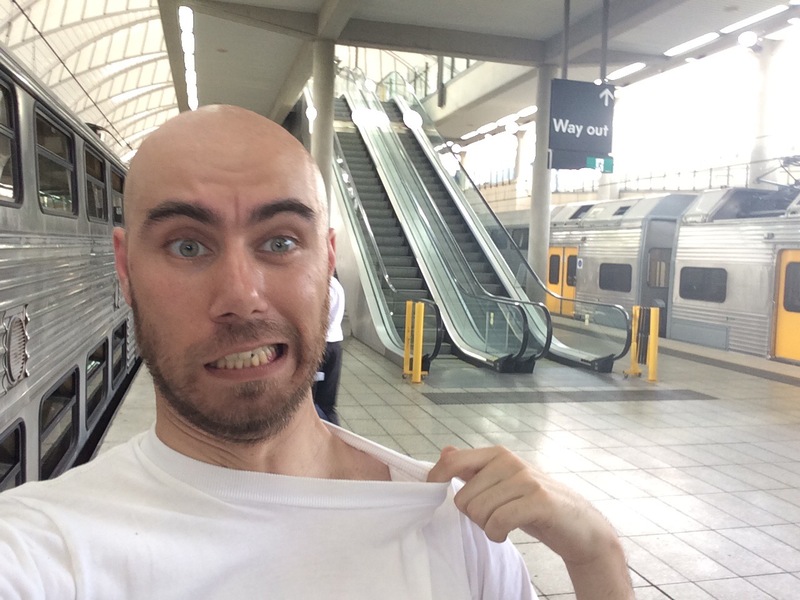 5:55PM – I’ve decided to get the Schofields train and then change for the Richmond train. Mainly to spice things up a bit. Still not tired. Have 4 cans of red bull in case I need them, but haven’t needed any yet. 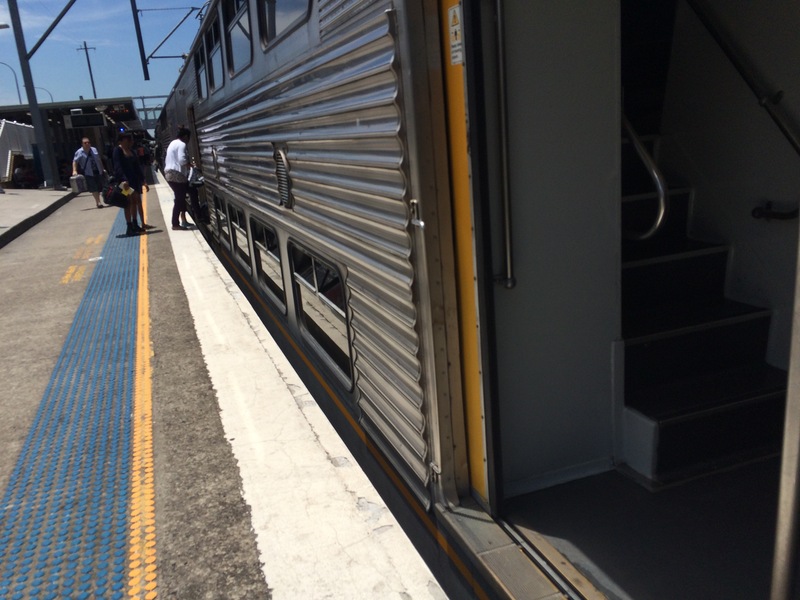 6:03PM – The next train is a Waratah. Woooo! 6:15PM – I’m pretty set on my timetable. I doubt that the East Hills train at Glenfield will be 3 minutes late, but it’s not out of the question. And the platform layout of Glenfield makes it one of the few stations where this could happen. 6:26PM – Reached Richmond. That makes 142 stations out of 176, plus 2 bonus stations. Time for a McDonalds break. Will try to upload a video. 6:44PM – Back on the train for the return journey to Granville didn’t get enough time to upload the video. Will do it when I get home tonight. It’s me running across Clyde to get the train that would put me an hour ahead. Still need to stop at Toongabbie, Pendleton Hill, and Wentworthville, then that’s the Western Line done. John is on track to finish at 10:35PM, shortly after me at 10:24PM. Will see who has the most points, I think he will. 8:30PM – My train from Granville has reached Glenfield and terminated. The East Hills train I was hoping would be at least 3 minutes late is running 26 minutes late! This is good, as the Glenfield platform layout is not quite as I expected, and I wouldn’t have been able to do a cross platform transfer. Instead the plan is now to take the next South Line train down to Campbelltown, then an Endeavour from Campbelltown to Macarthur. There I’ll catch the late running East Hills train which I mentioned earlier (it turns around at Macarthur, so it running late means I’ll be able to get on that train instead of the next one). 8:55PM – Arrived at Campbelltown on a C-Set. Just add the Endeavour and that means every train type except for K-Set. Doing well! 9:00PM – How easily fooled I am! I didn’t realise the Endeavours left from a different platform hidden away at the back. So I instead caught the late running East Hills train, which arrived at about the same time. The good news is that I’m currently on track to finish at 10:08PM. Which would give a total time of 16 hours and 21 minutes. I’m quite pleased with that. 9:39PM – Did I say 10:08PM? Turns out I need to change to an all stations train. So make that 10:16PM. Though that’s still earlier than the unmodified 10:24PM goal at the start of the day. 12:06AM – We head to the pub across the road to work out how many points we all got. John had most of his day on in an excel spreadsheet on his tablet already, and had inputted some of mine and Colin’s based on our plans. We managed to work out where Colin was based on common trips we each made with him. I manage to come out on top with 193 points, while John gets 158 points. Colin is disqualified for not completing all stations. I then caught the last 372 bus of the day back home, having caught the first one in that morning. It seems I named this post with the wrong date. It has been corrected from the 2nd to the 3rd of October. Overall the day ran quite smoothly, John commented that he did not miss any connections due to delays, but did get on the wrong train at one point which ended up adding about 40 minutes to his total time. The early delays actually benefited me, allowing me to catch both the late running Lidcombe to Clyde train and then also the late running Clyde to Emu Plains train. However, that second train was running so late that it terminated early and prevented me from getting to Emu Plains on time. Had it reached Emu Plains then it would have been a very tight connection at Emu Plains and then Blacktown, but I might still have finished half an hour earlier even if I had missed one of those two connections. The other major delay I experienced was on the East Hills Line, which again enabled me to catch an earlier service when that train was running late, enabling me to finish at 10:14PM instead of my then ETA of 10:24PM. John also pointed out that since I did the North Shore Line first and the Northern Line second, that it was a waste of time to travel all the way from Epping to Chatswood and back. I could have gone into North Ryde and changed there on the underground island platform, catching the previous train. This would have also enabled the opportunity to make the negative 1 minute transfer at Clyde without having to make the zero minute transfer at Lidcombe that I was successful in achieving. Speaking of which, here is the video of my mad dash at Clyde from platform 1 to platform 5.